International standard size Finger Hook & Loop (Velcro) sanding sheets. Perfect for continuous use multi-tool finger sanding pads requiring quick attach hook & loop sandpaper. 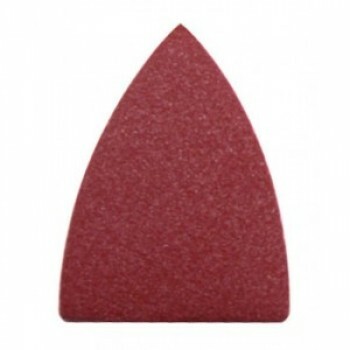 This sandpaper used for tight spaces sanding on any standard size Finger Sanding Pad. Non-perforated sheets can be used universally on almost any multi-tool with a Finger size Hook & Loop Sanding Pad. paper size 1-7/16 width X 2 inch long to sandpaper pointed tip. Multi-tool performance hook and loop (Velcro) finger sanding sheet size. Perfect for multi-function oscillating finger sanding pads that require quick attach hook & loop sandpaper. These durable finger sanding sheets are for use with almost any brand multi-tool with a Finger Pad hook & loop sanding attachment. 5 non-perforated sanding sheets per quantity. ATTENTION: Extend the life of your sanding pad & sheets by minimizing velcro damaging heat build-up as you sand. Set your machine speed to low and keep moving your sander around quickly. Avoid pressing into the pad tips by keeping your pad flat to the surface as you work. When sanding please stop every 45 seconds to check for sandpaper wear and heat build-up. If you don't keep checking you will sand all the way through the paper or melt into the backing pad. (Non lmperiaI BIade Product. Imported from overseas). Use on wood, metal, fiberglass, plastic, enamel, resin compound, leather etc.